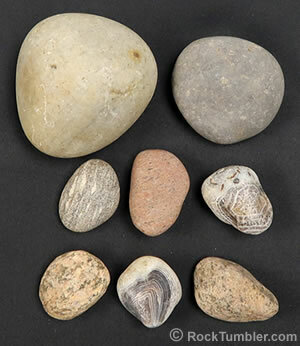 Here is a sample of some materials that were "rounded-by-nature" in streams or on beaches. While they are smoother than crushed rough they are a long way from being ready to polish in a rock tumbler. 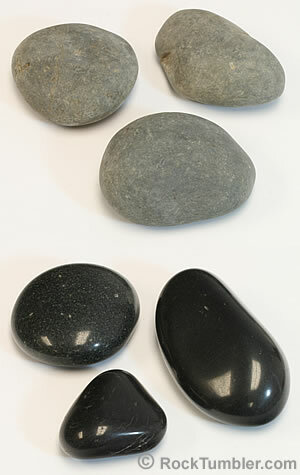 From left to right, starting with the top row: quartzite cobble, basalt beach cobble, gneiss pebble, granite pebble, partial nodule of Botswana agate, granite pebble, partial nodule of Botswana agate, gneiss pebble. One of our favorite rocks to tumble is a rock that has been tumbled to a nice shape by nature. These nature-tumbled rocks are often found at beaches, in streams, and in sediment deposits. You might also find nice nature-tumbled material in the landscaping supply section of a home improvement store. We enjoy tumbling these types of rocks because we can be fairly confident that they will produce a finished tumbled stone with a nice shape! We can also be fairly confident that these rocks are free of weaknesses and fractures - or nature would have broken them. A lot of people think that rocks that have been "rounded by nature" are "ready to polish" or at least "ready for fine grit". We made that assumption too, but learned through experience that "rounded-by-nature" rocks often need just as much time in coarse grit as a rock that is broken and angular. The short answer is that "rounded-by-nature" rocks often have two types of damage: 1) many of these rocks have been exposed to the elements for long periods of time, and that exposure has produced a "weathering rind" completely covering their surface; and, 2) many have been bruised by nature and are now completely covered with tiny fractures that often can only be seen with magnification. The weathering rind and the surface bruses must be completely abraded away if you want your tumbled stones to have a great polish. We will describe these challenges of "rounded-by-nature" rocks below and explain how we responded to them. Exposed to nature, all rocks will be attacked by the chemistry and physical forces of their environment. As an example, the minerals in a piece of basalt will be altered with exposure to the moisture present in the environment. Did you know that rainwater is slightly acidic and contains carbonic acid that, over time, will slowly break down the minerals in most types of rocks? Soil moisture and groundwater contain many more dissolved substances that, even in low concentrations, will cause significant damage to a rock over time. Exposed to nature, all rocks are also attacked by changes in the temperature of their environment - especially when they are exposed to freezing and thawing. Small amounts of moisture can penetrate the pores of a rock, and when that water freezes it expands slightly. The force of expanding water, (or expanding salt crystals in arid environments) applied repeatedly over many years can at first produce microscopic fractures, which will then grow to significant fractures, which will eventually penetrate deeply and ruin the integrity of the entire rock. Before you can achieve a polish on any weathered rock, the weathering rind (the altered outer surface of the rock) must be completely abraded away because weathered rock will not accept even a slight polish. Freezing, thawing and chemical alteration can be severe enough to reduce rocks to chalky materials that crumble in a rock tumbler. 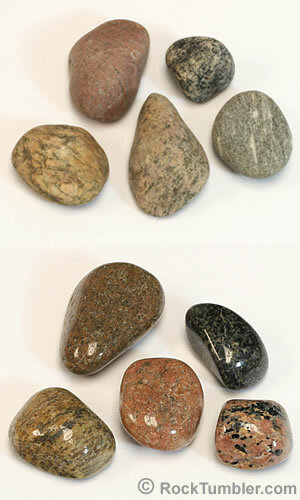 We have seen stream-rounded rocks of many different kinds with weathering rinds from 1/8 to 1/4 inch thick. These can take a week or more to remove in a large rotary tumbler such as the Thumler's Model B using coarse grit. It can take even longer in a small tumbler such as the Thumler's MP-1, Thumler's A-R1, or Thumler's A-R2. Yes, rocks can be bruised. If you get two quartz spheres and tap them together, you will likely produce small fractures at the point of impact. In quartz, and most other materials that fracture conchoidally, the impact will produce small curved fractures that penetrate into the rock. These types of impacts can also cause bruising of quartz in your tumbler. But, in the much more violent environment of a stream in full flood or on a beach battered by the waves of a storm, you can bet that the bruising will be much more severe. When we are able to obtain it, we sell nodules of Botswana Agate from a location where they have been battered around by wave or current action. These nodules take a fantastic polish and are beautiful - but to get that great appearance you must abrade off at least the outer 1/8 of an inch to eliminate all of the tiny bruises. One-eighth of an inch doesn't sound like much, but these agates are really hard and grinding that much away in a small rotary tumbler will take at least a week, or two weeks, in coarse grit. On this page we have posted before-and-after photos of several types of rock that were first shaped by nature, and then polished by us in a rock tumbler. We also share what we needed to do to prepare them for polishing. 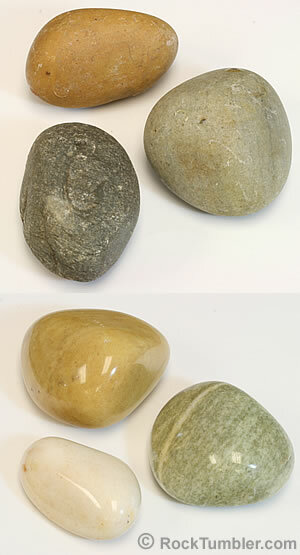 "Shaped-by-nature" rocks usually are not the quick-and-easy route people expect to producing tumbled stones. Give these rocks the care that they deserve and you might produce some beautiful tumbled stones. On the other hand, if you only give them a few days in fine grit and then toss them into polish, your stones will be dull or chatter-marked because you didn't grind off the weathered surface or grind away the bruises. Granite and Gneiss pulled from ground cover around shrubbery. The top of the image shows what the polished ones on the bottom looked like before tumbling. We purchased a home that had beautiful rounded river stones from the Ohio River used as a ground cover in the shrubbery. These stones were either dredged and screened directly from the Ohio River bottom sediments, or were screened from the sedimentary terraces that line its banks. They came from the southward-flowing part of the Ohio River along the boundary between Ohio and West Virginia. The granites and gneisses are not locally derived; they were delivered by glacial ice from Canada during the Great Ice Age and then washed into the Ohio River by local streams. Only a fraction of the river stones here are Canadian. The rest are locally derived sandstones and siltstones that are absolutely worthless for rock tumbling. The stones in the top photo above have been scattered on Earth's surface or buried in sediments since the end of the Great Ice Age, and that exposure created a weathering rind over their entire surface. We rotary tumbled them in coarse grit and about 20% ceramic media for a little over a week to completely remove the rind. Then they were vibratory tumbled in a Lot-o-Tumbler Single, with about 40% ceramic media, for two days in medium, two days in fine, and two to three days in TXP polish. Finished stones are shown in the bottom photo with a bright lustrous polish. The starting stones were all about 1 inch to about 1 1/4 inch across, and they lost about 1/8 inch all the way around during the tumble - making them about 3/4 inch to 1 inch across after polishing. Although they only lost about 25% of their diameter, they lost about 40% of their weight. If you saw that these stones were already rounded and decided that you could start fine grit, your polish would not be pretty. You might have decided that "this stuff doesn't tumble well" and tossed it out. But, by treating it properly you obtained some nice tumbled stones. Here is an article with a photo of some igneous and metamorphic tumbled stones that we picked from landscape gravel. Note: We carefully picked these rocks, selecting only those that were really nice, not badly weathered, and unbroken. Remember, garbage in means garbage out. We bought these in 40-pound bags at Home Depot for just a few dollars per bag. The rocks are beach cobbles of black basalt between three and four inches across, imported from Mexico. See how gray they are in the top photo and how black they are in the bottom photo? The gray material in the top photo is a thick weathering rind. It was easily scratched by a nail, By scratching with a nail we could tell that the weathering rind was at least 3/16 inch deep - but the interior rock was more competent. Then we tumbled them in a Thumler's U-V18 vibratory tumbler with at least 50% ceramic cylinders. We added enough ceramics to fill the bowl nearly to the top of the central cone of the bowl. It is important to use a lot of cylinders or these stones will really hammer one another - and hammer your bowl. In the U-V18, they vibrated two days in medium, two days in fine, and about three days in TXP polish (we used about 50% extra polish because we wanted a thick slurry for these large stones). That transformed these stones from dusty gray cobbles to glossy-black massage stones. Learn more about basalt in an article that we wrote for Geology.com. Note: We carefully examined every stone in the bag. These are big stones and each of them would take up a lot of space in the tumbler. Our tumbler would only have space for 8 to 10 stones. The goal was to "reject them now" to avoid wasting time, wasting electricity and wasting grit and polish on stones that are not worthy materials. Any stone that was broken, showed signs of a fracture, or had an irregular surface was rejected. We rejected over 1/2 of the stones, but since we got the entire bag for a few dollars this was really cheap rough. Learn more about polishing basalt in a rock tumbler. Quartzite cobbles purchased in a 40-pound bag from Home Depot. While all of the pieces were not tumbling grade we did pick out good amount of pieces that we though were. These stones were all between about 2 1/2 and 3 inches in diameter, and the ones that we selected had a smooth surface, no breaks and no signs of fracturing. We tumbled about ten of them for two weeks in a Thumler's Model B rotary tumbler using extra-coarse grit (46/70 silicon carbide) and enough ceramic media to bring the barrel up to about 3/4 full (about 30% by volume). A couple of stones didn't satisfy us after the rotary step - fractures were revealed - and we rejected them. We then used a Thumler's U-V10 vibratory tumbler and tumbled the stones for three days in medium grit and three days in fine grit. We then tumbled them in TXP polish, using about 50% extra polish to make a thick slurry. The polished finish developed slowly on these stones. We checked the stones a few times per day, and the polish kept getting better and better before reaching a great luster after about three days. By then the stones were beautiful. One of these stones (lower right in the photo) was a fantastic green quartzite with a white healed fracture running completely across the stone. It is now one of the prize possessions of our office! Here are some Botswana Agate nodules that we sell for rock tumbling rough. These Botswana agate nodules are our best-selling tumbling rough of all time. We have a hard time obtaining this material, but when we are fortunate enough to acquire some, it always sells quickly. We show three photos here. TOP: These are rough nodules as we receive them. They have a dull appearance and with a magnifying glass you can see a lot of tiny curved fractures descending into their interior. These are bruises that the nodules suffered in their natural stream/beach environment. These agates are really hard and really tough - so it will take some serious grinding to remove the fractures. MIDDLE: This is what they look like after we tumbled them for one week in a rotary tumbler using coarse grit and proceeded through the polishing step. Phooey! The grinding wasn't deep enough. The nodules still have a lot of tiny fractures from the bruises descending into their interiors. We should have inspected them better before moving them to the vibratory tumbler. Back to coarse grit! Three tumbling steps, grit, polish, time and electricity wasted! BOTTOM: That's what we were looking for. Perfect stones. All of the bruises are completely removed and the polished agates are spectacular. They have beautiful bands and bull's-eye structures - and they accept a super bright polish if you spend the time needed to grind away the outer fracture surface. Our detailed Rock Tumbling Recipe for Botswana Agate Nodules can be found on the page where they are sold. Check it out here.